You are here: Home / authoritarian / Have You Ever Worked for Parents That Punish Their Kids Too Much? 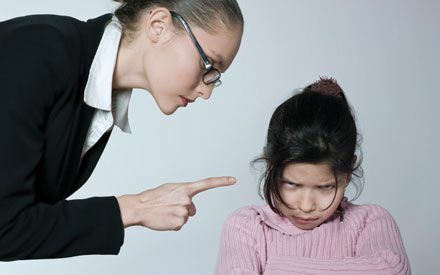 Have You Ever Worked for Parents That Punish Their Kids Too Much? Authoritarian parenting is also called strict parenting. Parents who adopt this parenting style are demanding of their children, but not particularly responsive to their children’s needs and concerns. These parents have high expectations for their children to conform to a set of rules of behavior. When their children violate these rules, the parents are extremely strict and punish the children, most often without any discussion. Generally, the parents won’t listen to or try to understand their child’s point of view. The authoritarian parent likes to remain firmly in control and rarely lets their children make his or her own decisions. Children raised under this kind of control often have less social ability. They are also more likely to experience a nervous breakdown, become runaways, or otherwise rebel against their parents. During the job interview nanny candidates should ask the parents what type of parenting style they have. Of course a parent isn’t likely to define their parenting style as authoritarian, indulgent and so on. So, nannies should ask questions about the parents’ discipline techniques to help uncover their parenting style. 1. What is your philosophy about discipline? 2. Specifically, how would you punish each of your children if their behavior requires punishment? 3. Are you consistent with your discipline style? 4. How will you support me when disciplining the children? 5. How do you handle temper tantrums? 6. How do you handle misbehavior in your children if they hit, bite another kid, yell, and so on? 7. Are you open to my using different and new creative methods of discipline? 8. Can you assure me that you will never spank or use unnecessary harshness when disciplining your children? 9. How and when will we meet each week to discuss issues about the children? « Do You Think it is Harder to Work for a Very Strict Parent or a Permissive Parent?